Born in Racine, Wisconsin, USA, on 19 April 1868, Paul P. Harris was the second of six children of George N. and Cornelia Bryan Harris. At age three, he moved to Wallingford, Vermont, where he grew up in the care of his paternal grandparents, Howard and Pamela Harris. 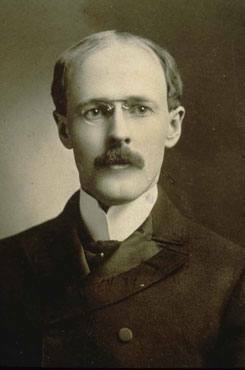 He attended the University of Vermont and Princeton University and received his law degree from the University of Iowa in 1891. While he was in school, both of Harris’s grandparents died, and he spent the five years after graduation traveling around the country and working odd jobs. After arriving penniless in San Francisco in 1891, he worked as a reporter for the San Francisco Chronicle and then as a ranch hand, grape picker, actor, and cowboy. He was also a hotel night clerk in Jacksonville, Florida, and a traveling marble and granite salesman. In 1896, he settled in Chicago and opened a law practice. Along with Gustavus Loehr, Silvester Schiele, and Hiram Shorey, he founded the Rotary Club of Chicago in 1905 and was elected its president in 1907. 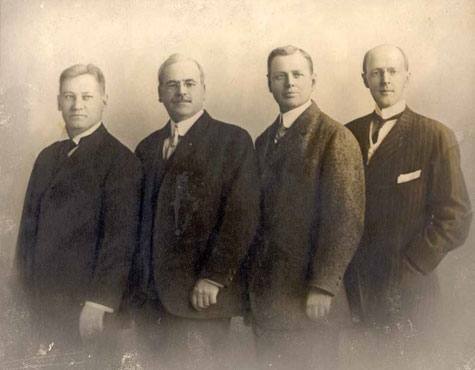 The first four Rotarians (from left): Gustavus Loehr, Silvester Schiele, Hiram Shorey, and Harris. Club membership grew rapidly. Many members were originally from small towns and found an opportunity for fellowship in the Chicago club. Harris was convinced that the club could be expanded into a service movement and strove to extend Rotary to other communities.